At the instigation of immigration judge William Cassidy, a former deportation agency prosecutor, on April 19, 2010 various federal officials and Paragon Systems, Inc. guards interfered with my Constitutional rights to observe deportation hearings for the detained docket in Atlanta, Georgia. Last week, Atlanta-based Eleventh Circuit District Court Judge Orinda Evans filed an order denying the federal government's motions to dismiss my pro se lawsuit based on those events and related ones. For background on the underlying complaint, please go here. The order allows me to show a jury the violations of my First and Fifth Amendment rights by guards employed by Paragon Systems, Inc. , and also to seek injunctive relief against William Cassidy, aka, the immigration-judge-who-deported-a-North-Carolina-born-U.S.citizen-who-speaks-no-Spanish-and-has-no-relatives-in-Mexico-to-Reynosa. Judge Evans also denied his accomplices' motions to dismiss my lawsuit, and so they also remain as named federal defendants who may be ordered to follow the law that they are charged with enforcing. These federal defendants are: Eric Holder, Attorney General; Juan Osuna, Director, EOIR; Fran Mooney, Assistant Director for the Office of Management Programs, EOIR; MaryBeth Keller, Assistant Chief Immigration Judge, EOIR; Gary Smith, Assistant Chief Immigration Judge, EOIR; William Anthony Cassidy, Immigration Judge (EOIR); Cynthia Long, Atlanta Court Administrator, EOIR; Darren Eugene Summers, DHS. Part of the order, alas, grants Department of Justice attorney/adjudicator William Cassidy absolute judicial immunity, from the damages portion of the lawsuit. I will be appealing that portion of the order on the grounds that Congress deliberately denied immigration judges any authority to control the physical movement of anyone in their hearings or anywhere else, unlike federal judges who do have legal authority over the physical movement of spectators in their court rooms. Congress provides federal judges the prerogative to issue orders to law enforcement personnel to make arrests and control the physical movement of people in their court rooms, and provides other contempt authority as well. None of these are in the statute circumscribing the contempt authority for immigration judges, which at most would be to issue civil fines, but only if authorized by the Attorney General, and the A.G. has not provided even this limited authority. Therefore, precedents that protect court room abuses by Article 3 federal judges do not apply to immigration judges. In addition to Cassidy lacking contempt authority, save the robes and other paraphernalia, immigration hearings are closer to kangaroo courts than actual judicial venues, including other administrative law proceedings. Unless the courts want to rule that federal employees who wear black gowns can escape accountability for their civil rights violations, juries should have the opportunity to hold accountable immigration judges, along with the rest of the thugs in that gang. Labels: Atlanta Immigration Court, EOIR, ICE deporting US citizens, lawsuits, misconduct, Stevens v. Holder et al. 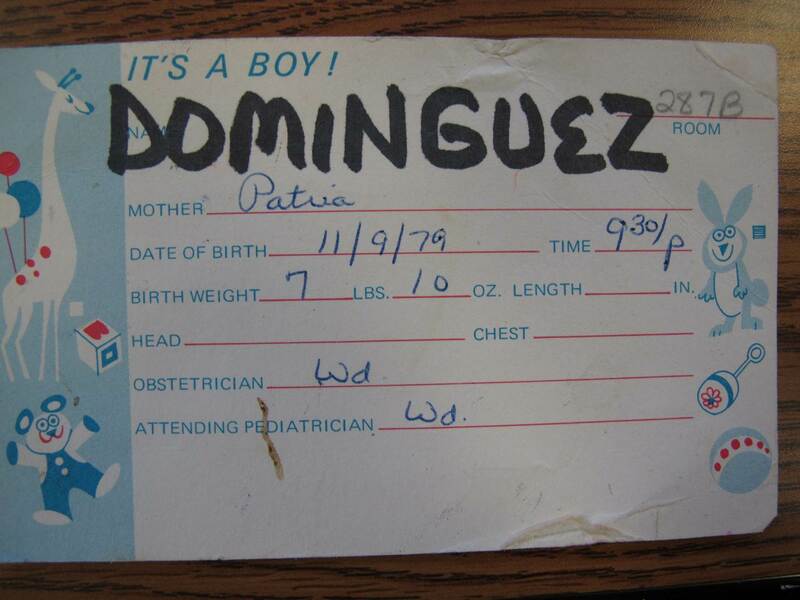 The tag for the Lawrence General Hospital infant crib Robert's mother saved from when he was born there; it has the same date and other information that appears on his official birth certificate. 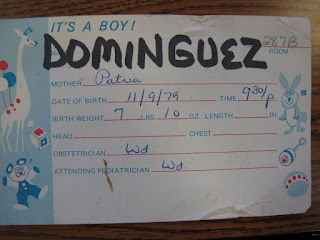 Robert Dominguez was born in November, 1979 in the Lawrence General Hospital, a modest brick building in the heart of Lawrence Massachusetts, about a 30 minute drive north of Boston. According to the first line of the 14th Amendment, that would make him a citizen of the United States: "All persons born or naturalized in the United States, and subject to the jurisdiction thereof, are citizens of the United States and of the state wherein they reside." But in 1998, deportation agents interviewed Robert, then 18 years old, at the Middleton jail. They asked him for proof of his claim to U.S. citizenship, "I'm American, I don't need to claim U.S. citizenship. If I'm born here, why do I need to claim it. I'm a U.S. citizen, I'm born here, that's all that matters. I let him know my part." Robert went back to his cell and thought that was the end of the matter. But when he was released, instead of being picked up by the bus that was supposed to shuttle him to the Lawrence Court House, he was picked up by some guys in green uniforms. "They kidnapped me from Middleton and brought me to New Hampshire, and kept kidnapping me to different systems." Over the course of a couple months, deportation agents ignored his statements about being born in the United States and shuffled him around a few deportation jails in New Hampshire and Massachusetts before taking him to a detention center in Batavia, New York where, he said, "A lot of people were on a hunger strike. 'If you bring me back to my country they're going to kill me.' I'm thinking, What the hell is this place?" For the first time he was given a copy of some bogus paperwork his parents put together in the 1980s and that Robert didn't know about. Those documents stated, incorrectly, that Robert was born in the Dominican Republic. Robert also has two social security numbers, one from shortly after he was born, and another from after he returned from the DR with his mother. I never have had an immigration problem, getting jobs, being part of a school. It never affected me. They always asked me for my papers and where I was born and I would always tell them I was born here in the United States because that's what I thought all my life, until recently I just found out I was born over there, and I never had any problems with none of that. And if you could really reconsider me not getting deported, I would really appreciate it. Robert explained, "I got all these very professional American government people right there telling me [I'm not a U.S. citizen] and I'm like, 'Wow...'" Reid, who is still deporting folks from the same court in Batavia, never asked for more information about why Robert thought he was born in the United States. Speaking over a televideo contraption set up in the Batavia, New York detention center--the only attorney in the room with him being the guy working for the government and trying to deport him, Robert begged Reid for mercy, when what he should have been demanding is the enforcement of his Fifth and Fourteenth Amendment due process rights, including a right to an attorney and not what Reid mentioned, a gimmicky list of folks who supposedly would provide pro bono legal services. The U.S. Constitution requires neither that Robert nor anyone else do something impossible, i.e., recall first-hand the details of her birth, nor that one have legal expertise on the nuances of deportation and citizenship laws. And yet that is exactly what the government is demanding when it deports people, including U.S. citizens, without providing assigned attorneys. The next thing Robert knew is that Reid ordered him deported to the Dominican Republic, and not to return for at least ten years. His file shows a round-trip trip ticket booked on American Airlines from Buffalo, New York to Santo Domingo, leaving on October 13, 1999 and returning on October 14, 1999. Robert, of course, only used half of that ticket. When he finally overcame his fear of being imprisoned for trying to return before ten years, he put together the documents his mother had saved from when he was born in Lawrence, presented them to the U.S. consulate in Santo Domingo, and in 2009 was issued a U.S. passport and used that to purchase with his own funds a ticket home. That passport has since been revoked and is part of Robert's damages in the pending lawsuit. The next post will describe Robert's time in the DR, including some amazing stories about his work as a telemarketer for global finance firms, including accounts of fraud by AIG and other companies.